I had a batch of end caps machined for the Carbon tube tank. This was 4" outer, 0.035 metal liner 0.009 poly bag, and 0.004 gap. I thought I could reuse these end caps in the 4" 035 wall tube, alas I neglected to account for the bag. So even with the loose fit, I thought I'd assemble the tank and hydro test one. The end cap retention failed at 420PSI. The cap retaining screws failed in shear. In hind sight I did not use enough screws, according to the screw stress calculations they should have failed at 390 psi. So all in all its nice to actually be building and assembling hardware again. So Mariellen's garden got its first dose of hydro test water, in about 4 years. to 600 PSI without failure. I wonder if you could do a flight to the 100 km von Karman for suborbital space before doing a fully orbital rocket. Even this is sufficiently challenging that there has been a $1 million prize competition established for a flight to this altitude for a single stage liquid-fueled rocket by a university team. Accomplishing this altitude can be made easier by using both carbon fiber for the propellant tanks and an aerospike nozzle. Amateur rocketeers working with solid rockets have been building their own carbon fiber casings for a while now. You can probably purchase one at the 4” diameter you need. 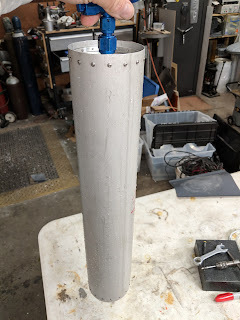 Surprisingly, an actual test of an aerospike nozzle still hasn’t been done at near vacuum conditions despite the fact the aerospike has been known of since the 60’s. The highest it has been tested is about 30,000 feet where the air density is still 1/3rd that at sea level. But even getting to 100,000 feet the air density is 1/100th that at sea level where the performance will be at near the vacuum levels. So even getting to this altitude will be a significant.advance in testing the aerospike. I can machine you some caps if you want.